Tutsan is part of the Saint John’s wort family and it is native to the UK although many people grow it in their gardens and then it can spread into the countryside by birds eating and dispersing the fruits and thus the seeds. Tutsan seemed like an odd name for a plant to me. There are plant names that seem quite ‘planty’ although you might not immediately know the origin. Names like Speedwell or Butterburr. Then there are names like Cow Parsley and Foxglove that are fairly obvious. However Tutsan seemed like a bit of a weird name to me.. sounding almost middle eastern. Another weird plant name… to me, is, Ploughman’s Spikenard…where did that come from? So I looked it up and it is not so weird.. evidently it is a compound of Tout saine… French, this literally meaning all-healthy. It is probably a reference to its healing properties. Nicholas Culpeper in his 1653 publication Culpeper’s Complete Herbal, says “Tutsan purgeth choleric humours … both to cure sciatica and gout, and to heal burnings by fire.” The berries which turn from white/green, to red, to black are however poisonous, so do not go eating them in the hope that you will become ‘all healthy’ tout saine. I suppose you should be a bit clued into its healing properties if you knew its scientific name…. 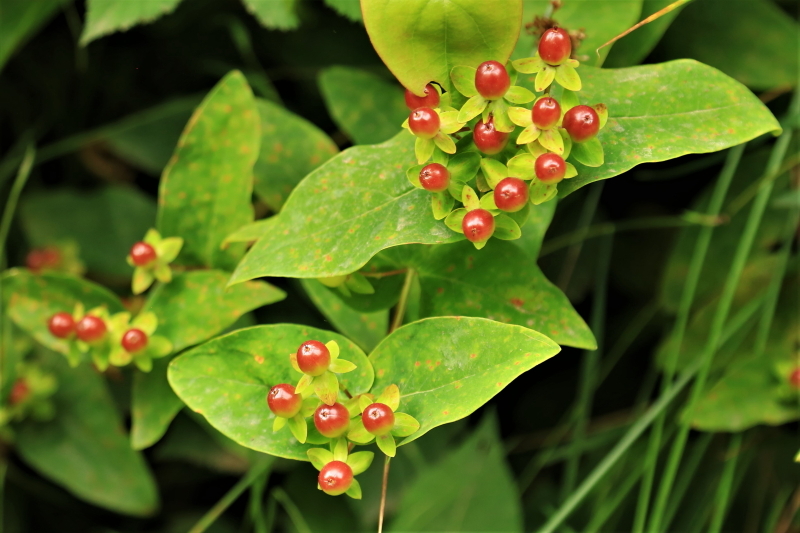 Hypericum, which is the genus that contains all the St Johns worts.. one of the mainstays of herbalists and alternative medicine wallers. Then from that it is a short step to Tout saine…. Oh well … now I know and so do you. OK lets have a look at the plant… as I said it is a small bush growing to a height of about 1 to 1.5 meters. It grows in shady places but not too dark, I have found it on The edge of paths and in woodland glades. It flowers in June and July, the flowers are bright and showy, with five golden yellow petals and with a big star burst bunch of stamens in the centre, splaying outwards. Right in the centre is the shiny bold and blatantly feminine ovary. This will develop into the fruit. Initially it is green and not so swollen but it soon swells up and ripens, turning yellow, then orange and eventually black. 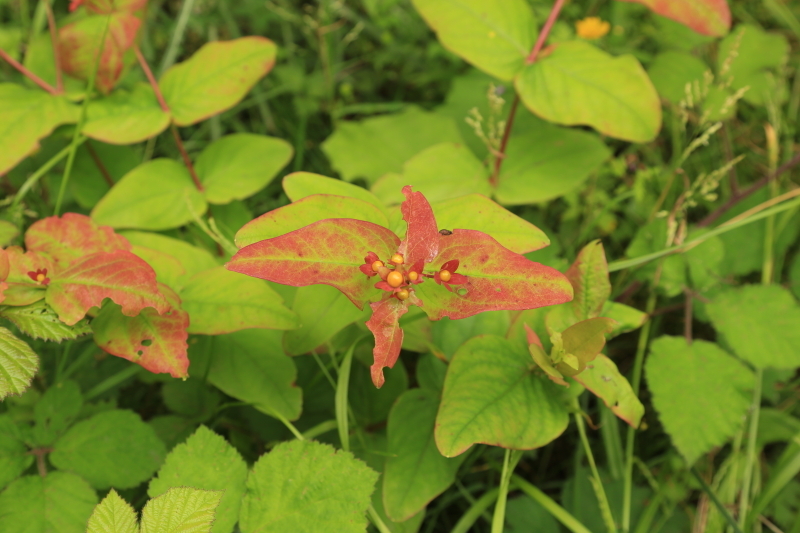 Immediately below the flowers/fruits are two pairs of leaves that are almost bract like, somewhat reminiscent of the Poinsettia. 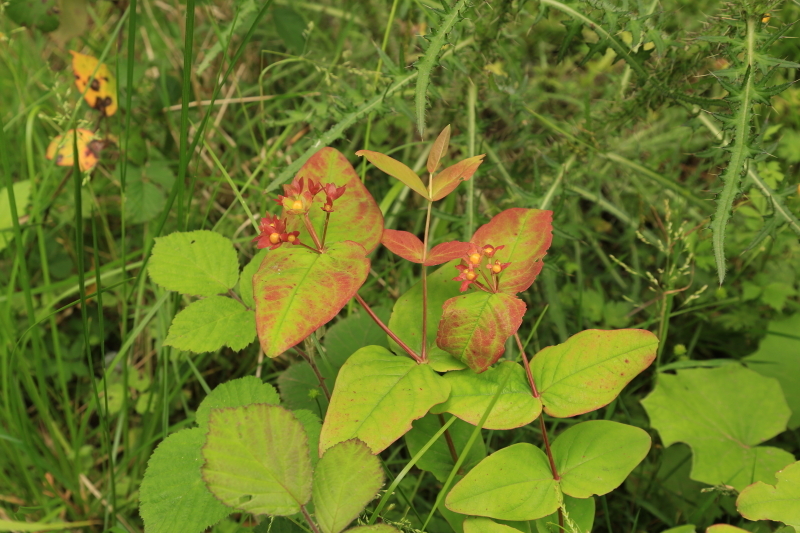 Also these somewhat modified leaves are often quite redish in colour, again like the Poinsettia. The red colour seems to develop when the plant is ‘stressed’ ie growing in an area where it is too bright. Many woodland plants react in a similar way the red colour is a secondary pigment which helps to protect the chlorophyll from phot oxidation. 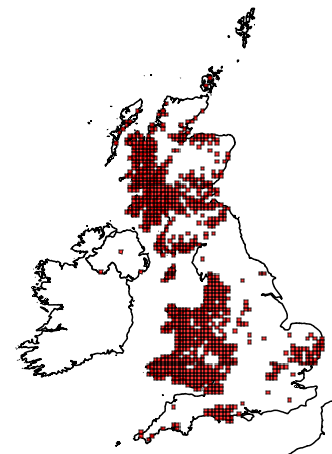 Its distribution is quite all or nothing preferring Wales and Western Scotland, so here in the Wye valley we are om the edge of its native distribution area. might have been used as bookmarks. The berries eventually turn dark purple almost black and seem to remain on the plant for some time. Here is a photo I took at Symonds Yatt of some Tutsan in January 2018.